After tasting this Azim fellas burger at TTDI, I was so disappointed with the way the burger came out I told myself, make my own wan, see whose burger tastes better. So finally last Saturday , I went buy all the stuff after a quick search on google, I clicked on Cooks.com recipe place went through a few recipes and went of to buy the ingredients. It was 7.7.7that day , so I wanted to do something abit more special la, like try to make burger all. 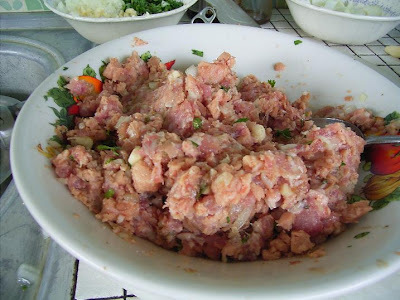 So here's what they suggested we get, Minced Meat, Worchestershire Sauce, Salt, and Onions. So simple only wo... so I decided to get some stuff lor. 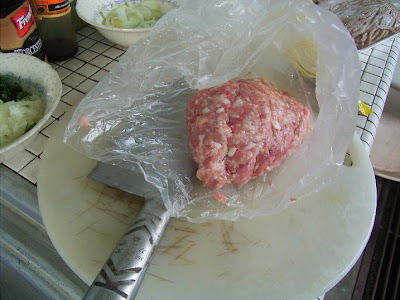 Before I left for the Pasar Besar in Cheras, behind KL Velodrome (white elephant now), I told myself , go get Minced Lamb, and Minced Pork la... can't make beef burgers, coz Sayang can't eat em. I walked the entire Pasar Besar Cheras, guess what ? I saw only 1 Mutton Stall, 1 Beef Stall, and about 10 Pork Stalls ( separate area). 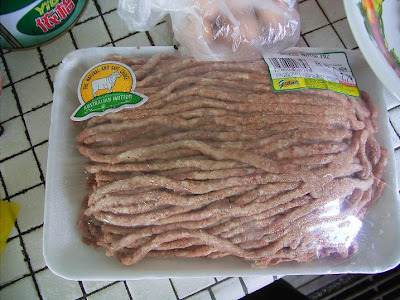 I managed to buy my Minced Pork, but Minced Lamb ah, sorry la.... they don't have lamb here, mutton saja ada. So next stop, Giant Taman Connaught. I managed to get minced mutton, spam, chicken frankfurter and corriander ( I thought I could introduce a little more herby aroma to the mutton) from here. Quickly rushed home to start putting in the ingredients for Marinating The Burger. Mix all the ingredients, and put into a bag, and leave it to marinate for a few hours , I left mine for one day. 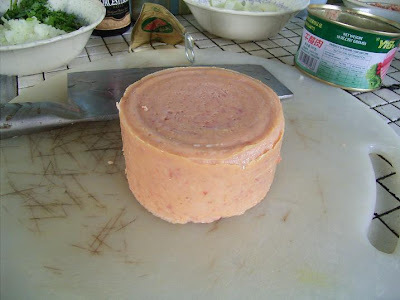 For Mutton Burger Patty, use the same thing, except you don't mix in the spam, and the frankfurter. Its D Day. Time to find out if your burger is nice or not. I was abit nervous to say the least, but can't wait to get the burgers cooked. So we chosed to cook the mutton patty first. Okay so now we need to add a bit more stuff. Notice that burger below, breaking up ? Thats because we forgot to put in one egg, and to mix it up together with breadcrumbs. According to Cooks.com, kalau tak ada breadcrumb, you can use Cracker Crisps ( like Jacobs lo, mash em up and mix it together with the patty). Grab a handful of the patty , shape it into a burger. If the meat feels like it doesn't want to stick, add 2 teaspoons of corn starch to a handful of meat patty. By now it should stick. Heat up your saucer pan, and put in two tablespoons Olive Oil. 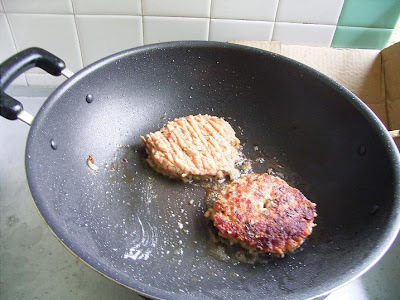 Lower the heat so that your meat patties can cook slowly without burning them. It took us three tries before the third mutton burger stayed together in one piece. 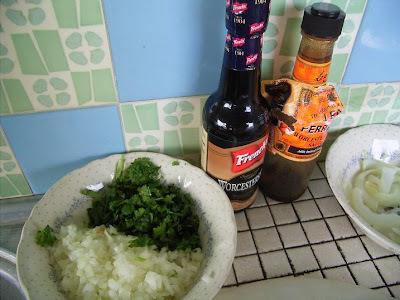 While cooking the mutton burger, you might want to add on some White Pepper, Black Pepper , Soya Sauce to add a little bit more taste to the patty, otherwise it might turn out to be quite flat. We went on to do the same thing for the pork burger. 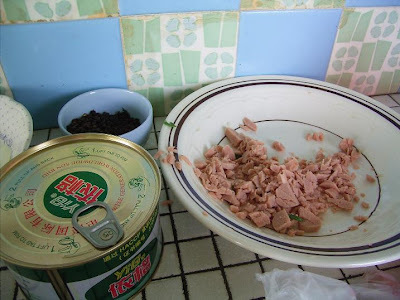 The only difference it that since I added SPAM which is already salted, I didn't add more soya sauce la, or more salt la. Sayang had bought some Salads the night before at Cold Storage Bangsar. Its not like I am advertising for CS, but we actually bought some really nice tomatos, big, juicy and firm. The salad pack, cost us about 4.99 ( it says serves 3-4 persons) and we bought 3 tomatoes which because it tasted so good hor, the tomato finished first. 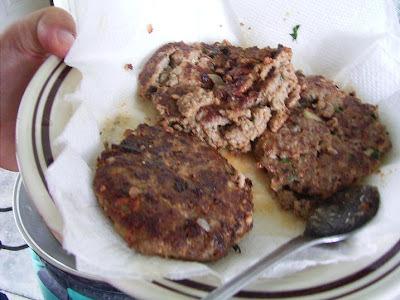 From those portions, we made: 3 Mutton Burgers, 5 Pork Burgers, and 2 Mutton/Pork Mixed Burgers. Bought 6 buns, Salads for 4 persons, and 3 tomatoes. I think that was just enough to serve 6 persons in my family. I also wanted to make Potato Wedges with Sour Cream in the beginning, but we didn't have time for it.